How about 'right to shirk' for taxpayers? Rally against right-to-shirk in Indiana earlier this year. 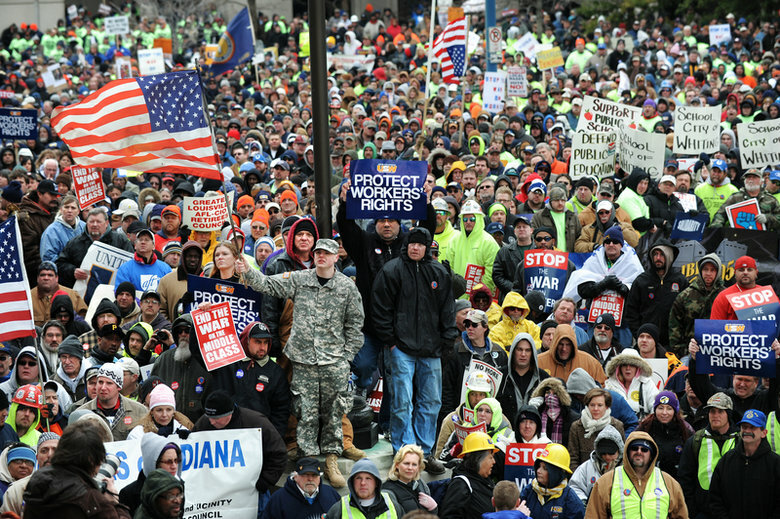 Indianapolis Star columnist Dan Carpenter has a tremendous response to the Indiana politicians who are hell-bent on passing a right-to-work for less law next year. Carpenter proposes a "right to shirk" law. He points out that right-to-work allows workers to shirk the cost of their union representation. And he suggests taxpayers be given the right to shirk the cost of their state government representation. In other words, if a Hoosier taxpayer doesn't like the job House Speaker Brian Bosma is doing, he could simply withhold his taxes. The way it would work is, any taxpayer who did not care to pay for efforts undertaken on his behalf -- the salaries of the governor and legislators, say -- could simply opt out. If those public servants failed to make a strong enough case for voluntary contributions, they'd just have to go scratch. How could House Speaker Brian Bosma, for instance, object? "The campaign for freedom," as he describes the Republican drive for right-to-work legislation, ought to extend to every citizen who doesn't want to pay for what he doesn't want to pay for. Like so much of the baldly partisan law that's been shoved through the Statehouse in recent years, right to work solves no problem in the real universe but instead creates new ones by antagonizing all sorts of folks, not only Democratic lawmakers, who might otherwise be enlisted to pursue the common good. The results of my research show that there is no difference in the number of business formations between right-to-work and non-right-to-work states. Moreover, from a state's economic standpoint, being right-to-work yields little or no gain in employment and real economic growth. In fact, wages and personal income are lower in right-to-work states. Given this, one has to wonder if there are ulterior reasons for the unrelenting promotion of the right-to-work "philosophy" -- and if these reasons are grounded in an anti-worker, anti-union mentality. 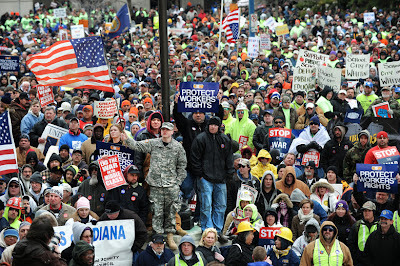 Keep up with the war on workers in Indiana at the StandUpForHoosiers Facebook page.